A few months after coming up with the idea of Dream Walkers, we were facing our first highline show as a team. It was really fitting that this show was happening in Tilburg, the home of Yuri and I. Also the first place we had our first team meeting.nnFestival Mundial seemed like the perfect festival to start off with for us. 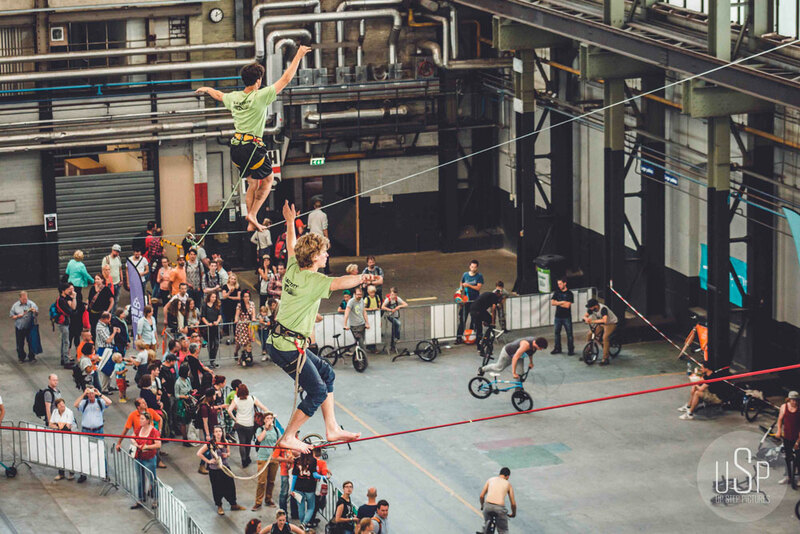 Famous for the always impressive line-up of artists from all genres, good food and culture, and the recently new urban location in the Spoorzone it seemed like a no-brainer to try and do a highline show at Mundial. 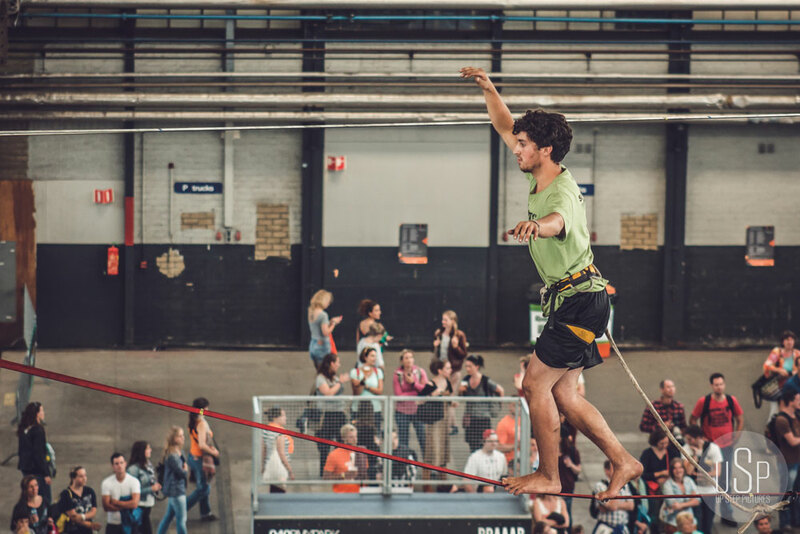 We had our entrance through Loïs de Jong, organizer of the Fusion Jam at Mundial and a slackline enthusiast. After some friendly conversation we got invited to check out the LOC-loods, the venue for the Fusion Jam, the Monday before the festival. It was better than we could have dreamed of! Endless possibilities for highlines, easy access and the most bomb-proof anchor points. A few hours later, two new highlines were established! 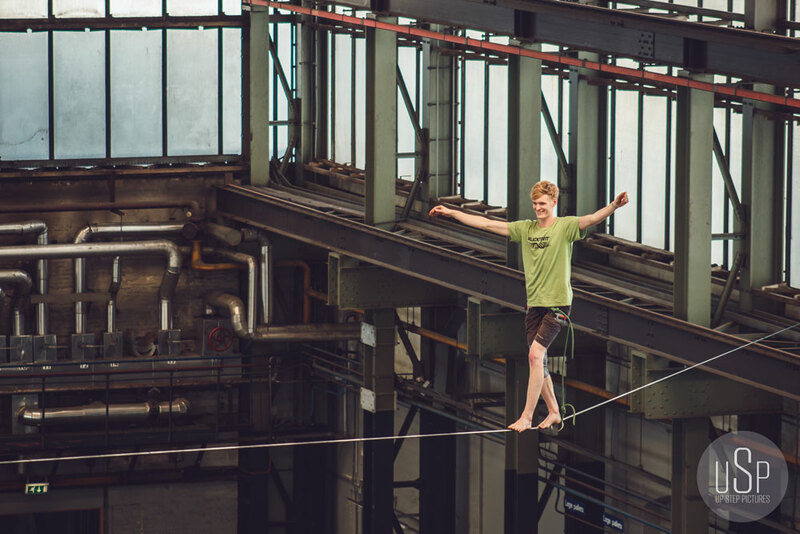 We rigged a 30m high tension double Redtube line designed to trick on, and a 38m double core 2 line quite loose, for a nice challenge. We were allowed to leave the highlines up from Monday until the Saturday of the shows and come in everyday to get comfortable with the venue and the lines. nnOn Saturday morning, the Fusion Jam started. 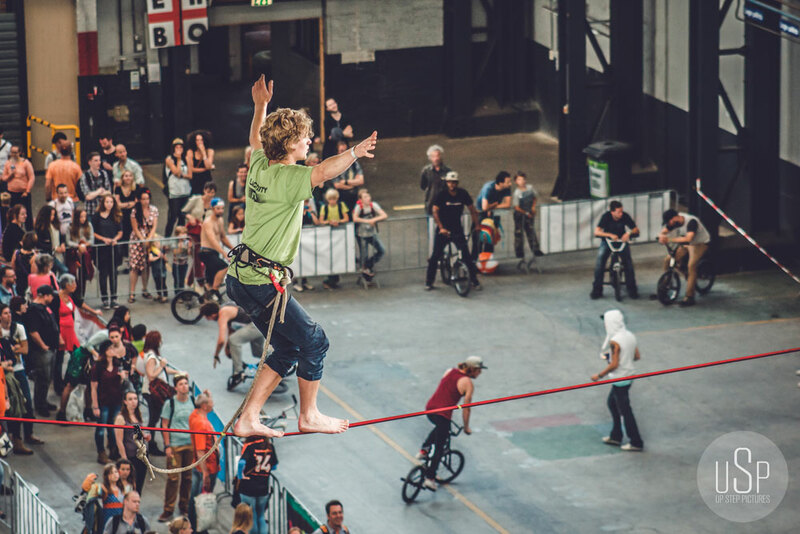 It was a grand spectacle with multiple disciplines of BMX, freerunning and beginner slacklines and tricklines by Slacktivity. 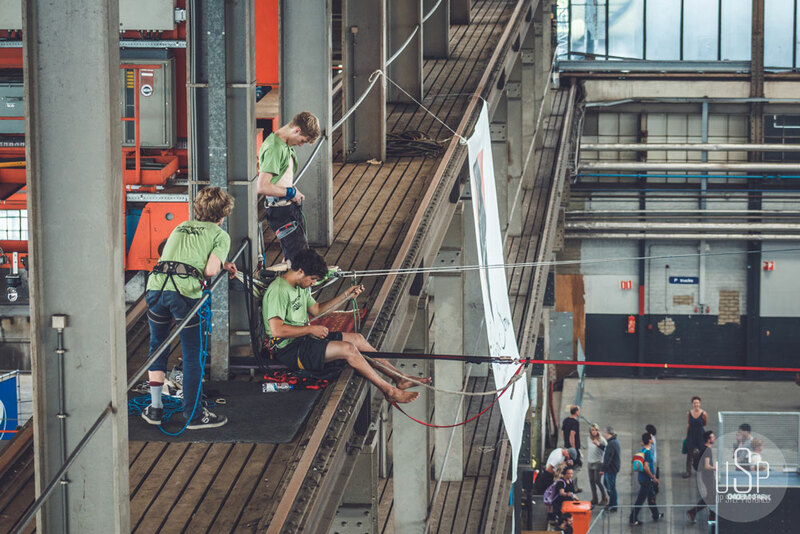 We realized soon, that two hours later we would be balancing above it all to entertain the people. We were a bit nervous for the first show, but as soon as we were on the lines we experienced the same state of calmness as always. Yuri started on the longer line, while I went on to the shorter one. After some exposure turns and bounces Yuri and me both got off. . I leashed in on the longer one, while Jonas prepared for his show on the 30 meter line. 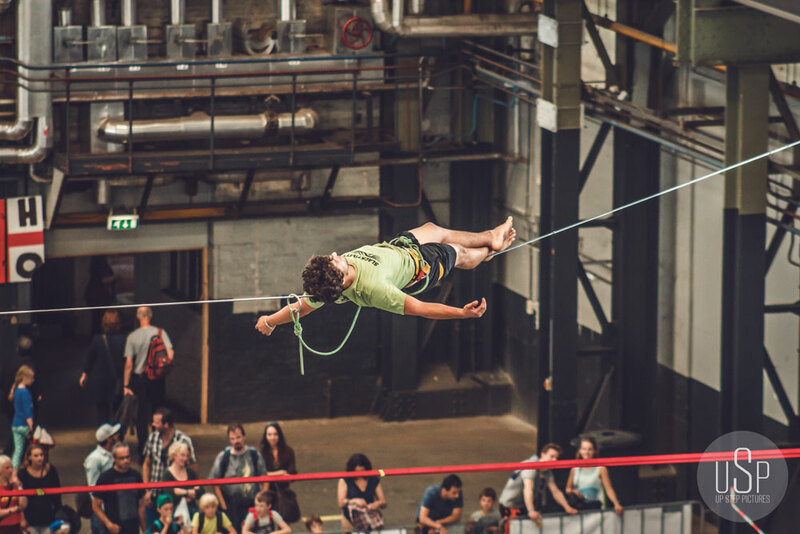 Jonas wowed the crowd with all kinds of static and acrobatic tricks, while I calmly walked the longer line and layed down in the middle to relax. A few minutes later we all got off the lines and high fived each other: our first show was done and it went great! 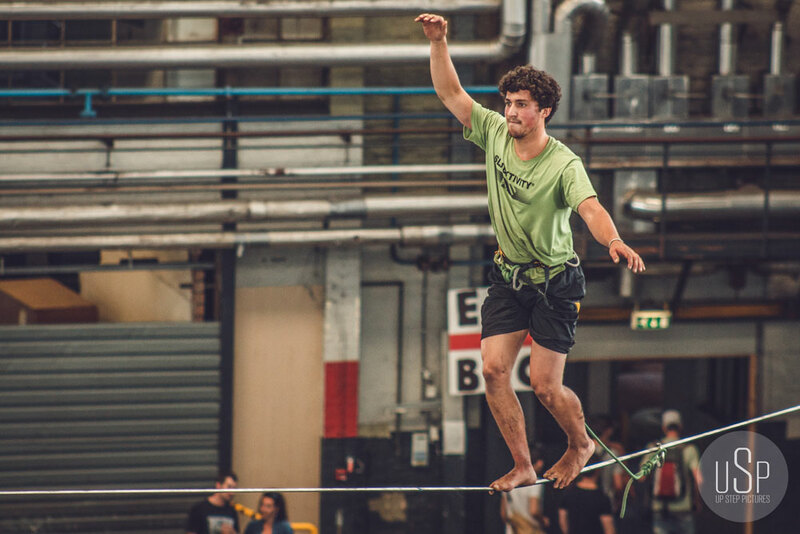 We had a few hours to catch our breath, explain people how to slackline on the ground and do some tricklining before we had to go up for our second show. It went even better and we were enjoying the reactions of the crowd a bit more. 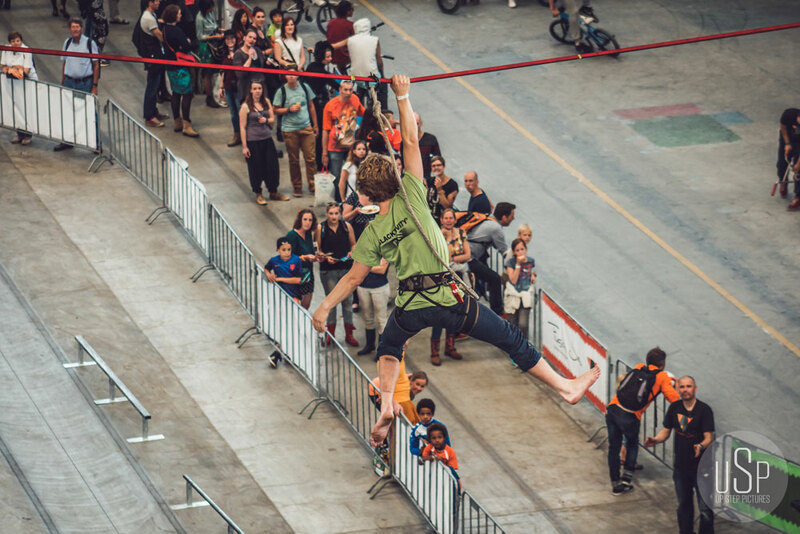 We followed up our first two shows by a great party in the evening, only to come back on Sunday morning for some more highlining. During the time of our fourth and last show, the Dutch team was playing in the world championship of soccer. We had no spectators and decided to watch the match ourselves and celebrate a close win over Mexico! All in all we had a great experience but still need to practice more to beat soccer in popularity!